My friend Bonnie is so impressive. Last year, while her kids were at sleepaway camp, she traveled to Medellin in Colombia to work on an early childhood development program, and came back with a determination to become fluent in Spanish. She’s been taking classes four times a week and told me over coffee last week, “It’s the best thing I ever did — like a whole new world has opened up for me that was right here all along.” I could, of course, completely relate, since I’ve been learning my own world-opening language this past year as well. It’s called Kid Instagramese, and for those of you who are not fluent, it might be wise to know a few crucial phrases should you ever find yourself on Instagram. Such as: “Like for a TBH,” which translates to, “if you ‘like’ my photo, I will then write a ‘to be honest’ comment about you, as in ‘tbh, ur really smart and nice;'” And “yasss” which means “yes” (Oh how my English-major heart aches); And “POS,” code for “Parent Over Shoulder” (hmmmm). There’s a lot of questionable stuff that happens on instagram (don’t get me started on the #20BeautifulGirls “challenge” that was hurtling through feeds last week) but one of the nicer byproducts, I have to say, is that the tween girl world has found all kinds of new ways to say “I Love You.” And while part of me worries that it’s cheapening the emotion a bit, another part of me says How can it be bad to spread the love in whatever form you can? 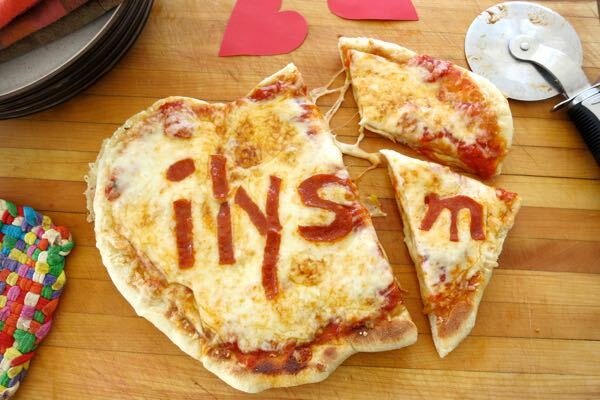 All of the love messages are short and sweet — “ily” and “ilysm” (i love you so much) and “ilysmudek” (i love you so much u don’t even know) and therefore perfect to fit onto their Valentine’s Day pizza. Pan-fried because, TBH, they’re a lot faster that way. 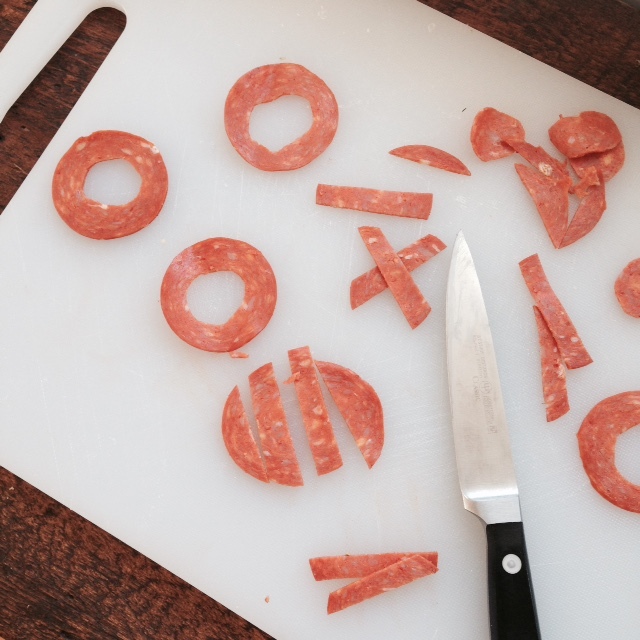 I find it’s best to stick with pepperoni messages that are simple — the pepperoni carving can get laborious. If you’re looking for more ideas, just open a pack of SweetHeart candies for inspiration. A few options: Wink Wink, Te Amo, #love, hug me, BFF. Watch your pizza under the broiler — the cheese can go from bubbly to burned fast if you’re not watching. Makes two pizzas; You can also bake one pizza on one baking sheet the old-fashioned way — here’s that recipe to riff on. Preheat broiler. Add olive oil to a cast iron skillet set on medium heat. Add one rolled-out pizza dough to pan and cook until dough starts to bubble, about 2-3 minutes. Flip and immediately spoon half the sauce on top. 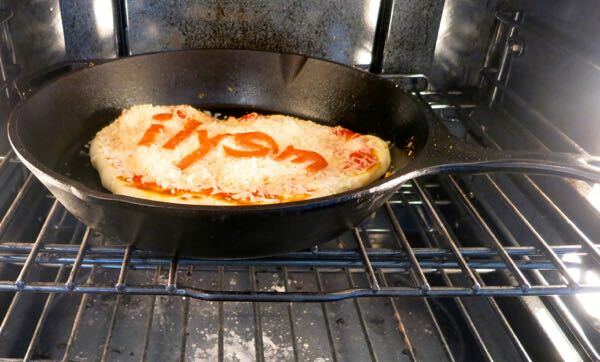 Sprinkle generously with half the cheese, and arrange your pepperoni messages on top. Let bottom cook, about one minute. Transfer pizza to the oven and broil until cheese is bubbly and pepperoni is browned and crisp, about 5 minutes. Repeat with remaining dough. *Note: I used Applegate pepperoni, and I’d be remiss if I didn’t mention that this idea came out of an “instagram takeover” I am working on for them today in honor of Valentine’s Day. I partner with Applegate on various campaigns, which you should know, but I would also like to mention that I’m not contractually obligated to write about them in the editorial space of this blog, so I don’t feel the need to call this a “sponsored post.” It’s important to me that you know this, because even though I do giveaways from time to time, I have never run a sponsored post on this blog and I don’t plan to any time soon. All brand endorsements you read about on Dinner: A Love Story are my own. Note #2: I’d also like to bring up, since a few of you have asked, that my 13-year-old joined instagram six months ago and can only access it through my iPhone, which makes me feel like I have some sense of control over the whole thing. I have her password and she knows I can check her feed at any time. My 11-year-old is not allowed on instagram yet, but she does get to man the dog’s account. I’m curious to hear how you guys handle social media in your house. Oh my these are so cute! My girls will love these. TBH (and I hope this doesn’t come across the wrong way) but thank you for sharing the photo of the pizza INSIDE of the oven – because that is what the REAL inside of an oven looks like. It makes me feel much less guilty about the inside of my oven. There are dried splatters all over and even though it is self cleaning, I’d much rather spend 5 hours cooking for my family than waiting 5 hours for it to clean itself. Love the new website design. Happy Valentine’s Day! Ha ha ha, Bea, that’s so cute. TBH, my oven is 10,000x messier and Jenny’s looks so clean to me! 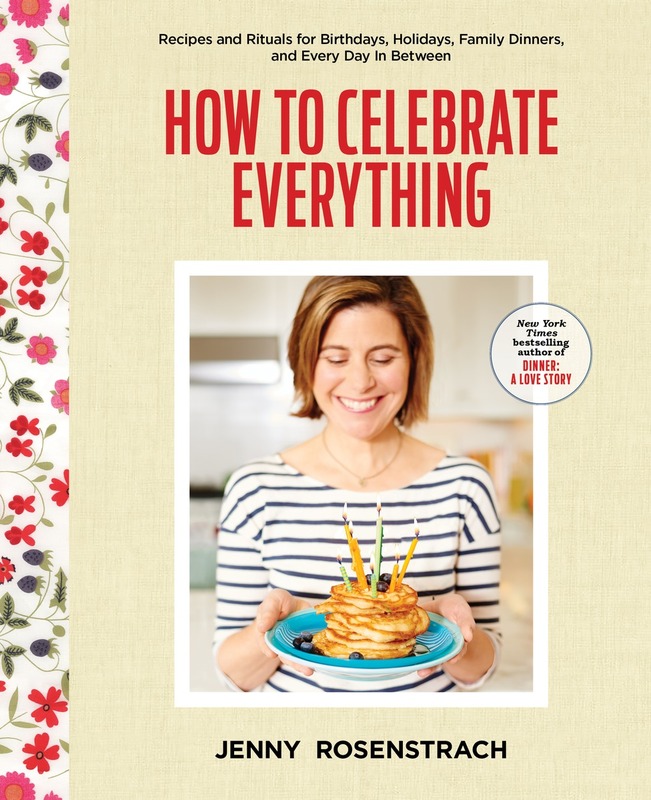 Thanks for a great stay-at-home Valentine’s dinner idea for the family. I’m wondering if you could do a post on cell phones and kids? As in, at what age is it appropriate for a child to get her/his own cell phone? I know that in certain family situations cell phones are helpful even with “younger” kids, but what about in general? 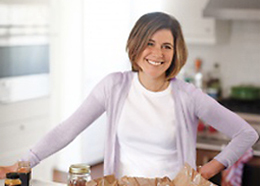 I read and appreciate your blog for great recipes, meal ideas, AND parenting tips. Thank you. My soon to be 12 year-old daughter will be exceedingly disappointed to hear that your 13 year-old was just granted an Instagram, as I still won’t allow her one. Nor does she have a cell phone right now. Nice to find like-minded parents around. And when she gets her Instagram account, likely also in the next 6 months, I’ll also have full access. But what a time consumer that will be! these are adorable and I’m sure kids would have so much fun putting this together! Perfect for our pre-VDay friday night supper! 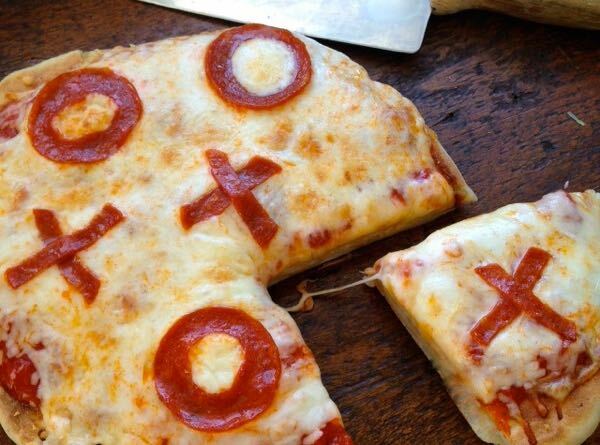 (valentine’s is pot roast at home and lots of vino)…maybe the Xs and Os will get my son interested in pepperoni? we are in a Hawaiian pizza rut….which is actually not a bad rut to be in! Love the new look! Also very excited about the concept of pan-fried pizza…genius. I love the new look of DALS! I am going to make these for Friday night pizza night this week. I was thinking of going out for pizza this week after the ignitor on my oven broke, but the broiler is still working. This will be a great start to our weekend. Thanks for the idea. True confessions–I let my 8 year old have her own Instagram account. I have this very sketchy theory that she might learn to use social media responsibly by starting at an age at which she is less inclined to dismiss advice and/or circumvent parental control. But it is a private account and almost all her followers are family. Every once in a while I get twitchy and do a sweep of her tablet, but mostly I have found that the things I worry about–bullying, online predators, etc–are things that have never even crossed her mind. She is way more aware of trends than I would prefer, but I think that is as much a function of living in an affluent area as anything. TBH, I liked this post a lot. My 14 year old daughter has an Instagram account that I monitor daily. So do her 25 and 22 year old sisters. My main rule when she started was that she was to not post anything that she wouldn’t want her grandmother to read. Kids need to learn how to self regulate on social media in our culture. It is our responsibility as parents to both monitor and regulate what is appropriate. 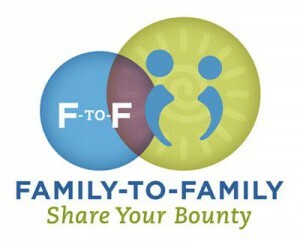 I liken it to other aspects of parenting and feel we have to be fully aware of what they’re doing. i love these! my girls are 3 and 4 and we have pizza night every Tuesday night! It was born out of necessity and desperation: We needed a night of no cooking during the week, aaand the place down the street had a Tuesday night special. voila. I may sub these for this week’s pizza night, though 🙂 I love DALS so much (ildsm). I tried pan-fried/broiled pizza recently and was smashed with the result…So easy, and so good. Posted the picture on Instagram (naturally). I am torn between this new (to me) method and my cast iron pizza pan…I think the pan method works great when you don’t need a whole bunch of pizza since you are limited by the pan size. I’m not sure where I got this idea, but i put pepperoni cut into hearts on our V-day pizza. Just to let you know I’ve linked this recipe into my latest post of my 13 favourite Valentines recipes and bloggers 🙂 because these pizzas look SCRUMMY! This is pizza looks so good and I can’t wait to make it for my boyfriend! Check out my blog? I’m excited to hear from you! these are super charming – just like your blog. love the idea! My 10 year old has a phone. She gets off the bus right before I leave the office so we FaceTime before I head home. It does not go to school with her. We approve every app on her phone which we monitor. She has an IG account but never uses it. She likes to follow animal accounts. Our big issue is YouTube. When she fell down the Minecraft rabbit hole and discovered all these gamers that post daily and weekly videos about the games they play for a living she got really into that. While they play games all day they film the game and talk about it and then post the videos to YouTube and make $$. They go to conventions and everything. It is kind of crazy. We had to put serious limits on how much time was spent watching YouTube as well as WHO we watch. I did use IG as a teaching tool about bullying b/c she was following a friend who accused a commenter on an IG photo of bullying when in fact it was simply a negative opinion, phrased in such a way that is was quite harmless. Clearly the school anti-bullying program isn’t getting the proper message across. No SnapChat, no public server Minecraft playing, no FB (though the young people tend to steer clear of FB these days anyway), NO Twitter. It’s not a fine line with the smart phone and social media – more like a HUGE, very BROAD, squiggly line. Much like all of life.